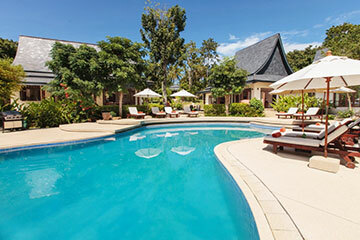 A spacious and private traditional Thai-style family-friendly hideaway, set within extensive landscaped grounds, a short drive from the beach. Amenities satellite plasma TV/DVD/CD surround systems in 2 living rooms, air-con bedrooms, 2 fully equipped kitchens, WiFi broadband internet, BBQ. Motsamot is a totally private and peaceful hideaway set within a beautifully landscaped garden. Wooden gates open to reveal a driveway with a large covered parking area and an imposing island feature of boulders and mature trees. Inspired by classic Thai architecture, Motsamot is a tastefully appointed and spacious family home with comfortable furnishing, Asian decorative artifacts, and all modern facilities. The villa is built around the central focal-point freeform swimming pool, and expansive surrounding deck area. A sala pavilion off the pool deck offers a shaded refuge. At the far side of the pool is a large gas BBQ that sits against a stunning natural rock feature. The pool deck is furnished with parasols and 8 cushioned sun-loungers. From the driveway, a covered Thai-style sala entrance leads to a stone pathway that runs through the extensive grounds and between the two mirrored pavilions that make up the property. Stepping stones across an ornamental lily pond with fountains complete the entrance. The open-plan living room pavilion comprises lounge and dining area with polished wooden floors and vaulted wooden ceiling. There’s a study at one end of this room that can be used as a nanny’s or kid’s room with a connecting double en-suite bedroom and a private patio leading out onto the garden. A second double en-suite bedroom has a separate entrance with views over the gardens, lily pond, and swimming pool. At the rear of this pavilion there’s a fully-equipped western style kitchen. The pavilion is surrounded by stone terraces and pathways that lead to a stylish outdoor shower. A stairway leads from the pool deck to the second pavilion, which is almost identical in design, and includes a second living room, with lounge and dining set, a kitchen and laundry room, 2 en-suite double bedrooms, and a single bedroom with en-suite bathroom. The verandah surrounding the living room has a removable wooden railing that can be used to prevent young children from wandering. Motsamot’s versatile layout is perfectly suited for two families, or a large group of friends. The villa offers a great sense of privacy and space, and is not overlooked by other homes. Its design gives a very natural and comfortable feeling and the layout of the pavilions, and the surrounding grounds, ensure that guests can always find their own space to relax in total privacy. The property stands alone and so no area is overlooked. While Motsamot is secluded, the island’s best beaches and a wide range of shops, restaurants, and entertainment are a short drive away. Motsamot is located in Choeng Mon, within 5 minutes drive from the superb beach, and some 10 minutes drive from Chaweng, and 15 minutes from Bophut Fisherman’s village. The Santiburi Golf and Country Club is located within 30 minutes drive. -Airport transfers are charged at $30+ USD per trip, for up to 9 passengers, subject to 7% tax. Arrange for a chef to prepare you a Thai banquet or your own favorite dishes.